"Do You Know The Way to St. Tropez? ": Steve Foster explores myth and reality during The Soft Machine's 1967 sojourn in the south of France, including claims of an hour-long "We Did It Again" performed naked at a pool party hosted by Brigitte Bardot. Looks like a Mary Wingish "Three of a Kind" set in there. Thanks for turning me on to all your shows, Matthew, (during the comments of The Avant Ghetto a few weeks ago). I've listened to about 7 of your shows so far, some early and some recent ones, all of which are as great as the best WFMU programs! They would fit right in on WFMU's archives. Great programming with very informative voiceover banter. Thanks again! Nice show, thanks for the Mars Volta, sort of a cross between the Material and Soft Machine version. I bet they heard the Material version first, and I bet they know Bill Laswell too. I wonder how many people he informed about Soft Machine? I bet a lot. Interesting tune 'We Did It Again'. I need to remember the story behind it. I'm sure Kevin listened to 'You Really Got Me' his share of times. :/ Thanks for the nod to Paul Kantner, RIP. 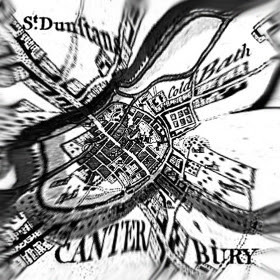 Matthew Watkins' new experimental-cosmic-local history book — an accelerating history of the City of Canterbury from the Big Bang to noon on 15/08/14! It includes historical background to the emergence of the Canterbury Scene as well as musical developments in the city before and since.